NOTE: If you have purchased a mushroom kit from me at the Farmers Market, and there is a sizable mushroom on the kit, you are at Step Four: Harvesting. OK. So how do you take care of your Toilet Paper Mushroom Kit? Place your mushroom kit in a cool dark place for 2-3 weeks. I placed my in my garage, which worked fine. You will notice covering of white, fuzzy mushroom spore and notice and perhaps cheesy/mushroom smell. This is a good sign. Note: You can keep your Mushroom in the frig for several months. Some people report that they can be stored for up to 6 months after colonization, but I cannot confirm that. A few weeks/months should be fine. Take Mushroom out of the frig. Untie the bag and spread out the bag to give the mushroom some room. Pour a little water in the bottom of the bag and spray the mushroom kit (roll). Place in a window sill. Keep the mushroom kit moist and lightly spray it several times a day. Within few days, you will notice little aliening looking blobs shooting out from the kit. The mushrooms will grow out from those blob. 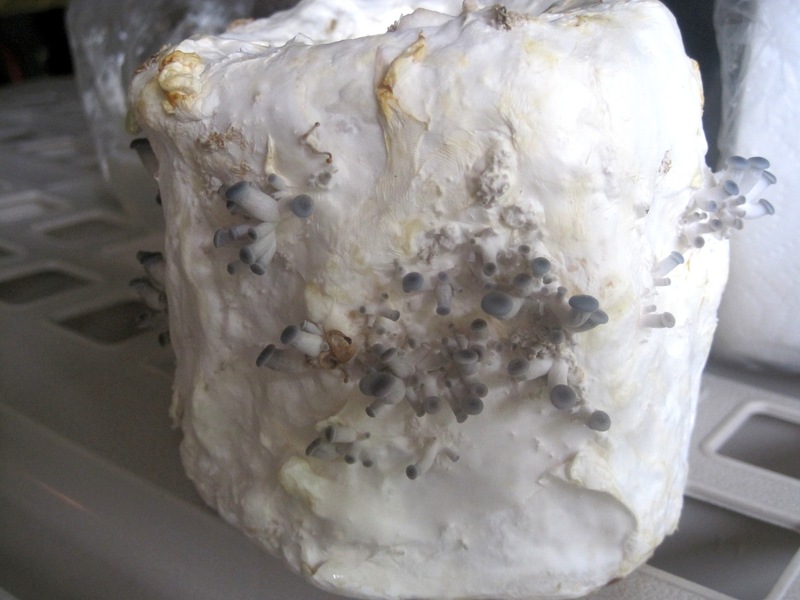 Note: There may already be some small fruiting mushroom clusters when you take it out of the frig depending on the temp of your frig and the amount of colonization. Keep up watering. Within about a week, you will notice mushrooms popping out from the kit. 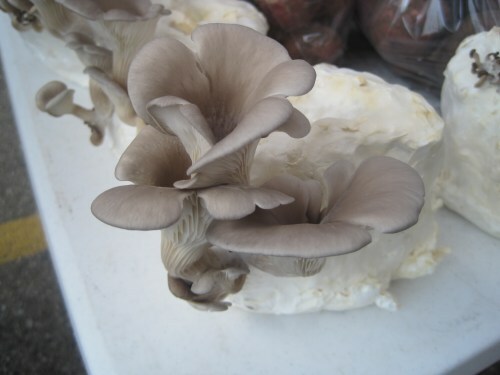 Mushrooms are ready to harvest when they start to take on a flatten appears with the top mushrooms. Twist off the mushroom from the base of the mushroom cluster. Repeat steps two through four. Note that can always refrigerate your mushroom kit for several weeks/months between fruiting/harvesting again. Note: A second harvest will take much longer then the first. A first harvest will take a week after the kit gets out of the frig, but a seond harvest can take several weeks. Also, the second harvest usually will be smaller (but could be equal) than the first harvest. Be patient and let the spore do its stuff and keep your kit hydrated. It will happen. The picture above was a rehabilitated kit that a customer brought back to me after she let it go dry, so there is hope for us who space out on watering. I replaced her kit for free and then I put the returned kit back in the frig and then kept it moist and it did come back. Second and additions harvest may take a little longer than the first to fruit. Be patient. 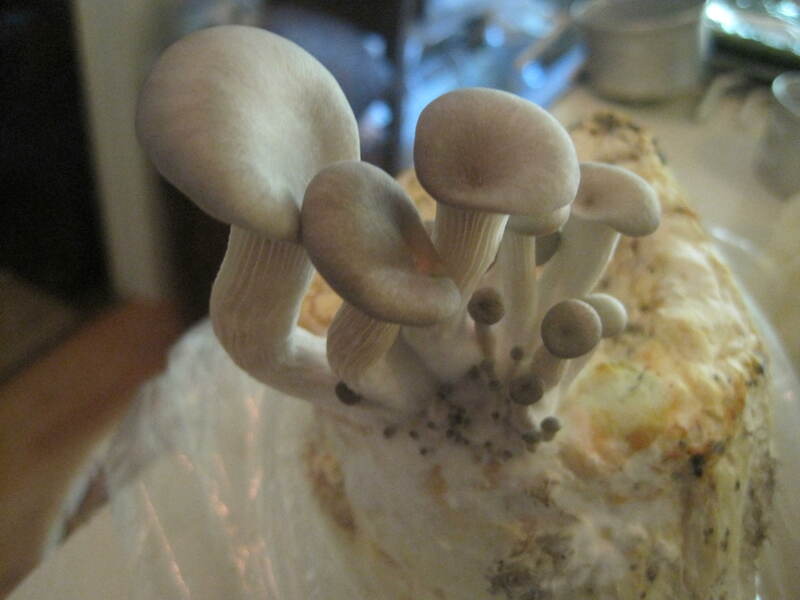 After 2-4 harvest, your mushroom may stop fruiting. The number of harvests will depend on the nutrition in the substrate (toilet paper). Once the mushrooms (spores) have used up all of the energy, the kit is finished. You can compost it or try your luck at adding more shredded (chlorine free) toilet paper to the kit to see if the spore colonizes the new “Food.” In theory it should work, but I have not tried it. The kit makes great food for your compost pile.